A testator, or person making a will, often names someone he trusts in the will to manage his affairs after his death. This person is referred to as a personal representative or executor. Since family members are often the most trusted people in the testator's life, one or more of them are frequently named as personal representatives even though they may also be devisees, or beneficiaries, under his will. A spouse may be the primary or only devisee under a will, acquiring all the assets of the deceased. She may also be the named executor in the will. Probate may merely be the process through which all property of the decedent is conveyed to her after payment of all debts owed by the estate. An adult child of the decedent is also frequently named as executor. Often, more than one child is named and can serve as co-executors jointly. Alternatively, the eldest child may be named to serve as sole executor, with another child being named as a successor executor in the event the eldest is unable or unwilling to serve. These same children are likely also to be devisees under the will, sharing the assets jointly or with a surviving spouse. A testator may designate a trusted friend to serve as executor of his will in case he is concerned about discord in the family if he names one of her children to manage the assets to be shared between them. His choice of an objective friend to manage his assets and keep the peace among family members may be rewarded by a specific devise under his will, such as a prized hunting rifle if the two hunted together, or even a cash or monetary award that is over and above what is customary for payment to an executor. There may be times, especially when an estate has numerous and diversified assets, when a testator names a bank or financial trust company as executor under her will. Probate may take years to finalize, and the executor receives compensation in an allowable amount from the estate for its services. This compensation is classified as payment for services rendered, and may be mentioned as such in the will. Although not technically considered a devise under the will, a corporate executor may be considered as a beneficiary. Law Offices of John W. Callinan: Should I name co-executors? Technically, the issue of custody disappears when a child’s parents die. Another adult will take over and raise the bereaved child, but the legal arrangement becomes one of guardianship, not custody. The probate court appoints a guardian to care for the child and a conservator to oversee the management of the financial details of the guardianship. Sometimes, a court may select one individual to serve in both capacities. You may hear the terms "heir" and "legatee" used interchangeably, but the words have two different legal meanings. 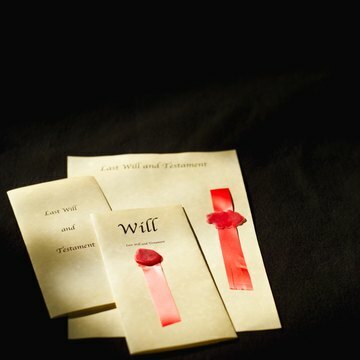 An heir inherits the estate of a person who died by relationship, descent, will or legal process wheras a legatee is any entity or person who received an inheritance from a will.